Theresa May will face up to her own desperately weak political position on Monday as members of Parliament move to take over Brexit policy and her own ministers plot to oust her. The U.K. prime minister is under pressure from colleagues inside her Cabinet to name a date when she will step down, with some arguing this would help her win support for her Brexit deal, people familiar with the matter said. 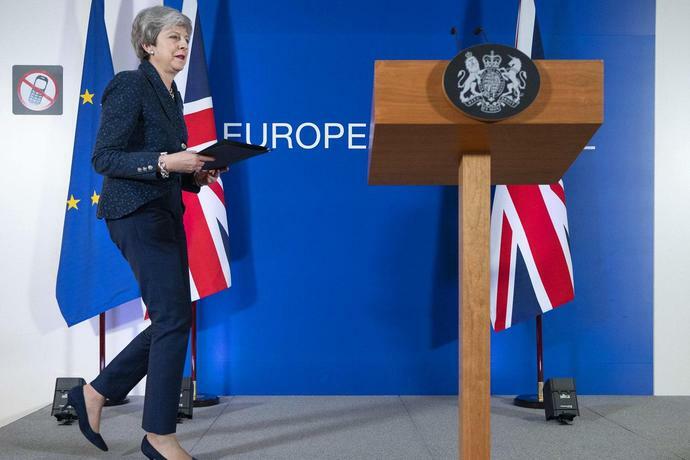 May is hoping for one more chance to put the divorce agreement she's negotiated with the European Union to a vote in the House of Commons this week. But she's still struggling to win over enough pro-Leave supporters in her Conservative party after the accord was rejected twice by huge majorities. Britain was supposed to be leaving the EU on Friday. Instead May looks set to spend the week fighting for her political life, starting with what looks likely to be a tense Cabinet meeting in London on Monday. Later in the day, the Commons is expected to vote on a plan that would allow rank-and-file MPs to take control of the legislative agenda for a single day, on Wednesday. More than 100 lawmakers have put their name to the amendment, put forward by Conservative former minister Oliver Letwin. This would allow lawmakers to express support for different options ranging from a second referendum to a customs union with the EU and even canceling Brexit, in a series of so-called "indicative votes," charting a potential solution for May. "We don't know what she could get a majority for," Letwin told BBC radio on Monday. "Once we find that out there's a way forward in principle and then the next thing would be for the prime minister to take that forward and or the government to implement that." Several ministers are said to be keen to ensure MPs are free to vote how they like and are not ordered by party "whips" to do as May tells them. The premier's office is so far not committing to allow Tories this liberty, potentially sparking another revolt from her ministers in her Cabinet. Over the course of a dramatic weekend in Westminster, rumors about May's departure reached fever pitch and an estimated one million protesters marched in favor of a second referendum. The EU postponed the U.K.'s March 29 exit date to give May more time to work out a way forward if her deal can't get through Parliament. EU leaders are demanding answers from Britain by April 12. The "lengthy talks" covered a range of issues, "including whether there is sufficient support in the Commons to bring back" her deal for a vote this week, according to a government spokesman. 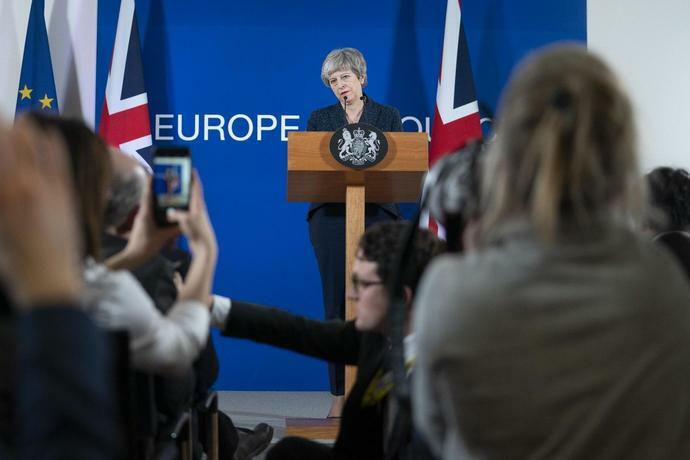 The gathering came after several British newspapers said the prime minister was under increasing pressure to stand down over her handling of Brexit, with reports that Cabinet ministers would confront her at Monday's cabinet meeting. Ministers were said to be lining up an interim leader to complete the Brexit process, with May's deputy, David Lidington and leading Brexiteer Michael Gove were both mentioned as possible caretaker leaders. Read More: Who Could Step in as Britain's Emergency Prime Minister? The alleged coup appeared to fizzle on Sunday, as Chancellor of the Exchequer Philip Hammond and other cabinet colleagues - including Gove and Lidington, publicly backed May. Still, the government is far from united. In comments that could deepen the split in May's Cabinet, Hammond refused to rule out holding a second referendum to help break the impasse over her Brexit deal, saying it was a "perfectly coherent proposition." Speaking on Sky's "Sophy Ridge on Sunday," the chancellor reiterated that it was up to lawmakers to come together to find a way forward if they continue to reject May's deal, and that the government would give them time to do that in coming days. "One way or another Parliament is going to have the opportunity this week to decide what it is in favor of," he said. Another referendum "deserves to be considered" along with other proposals, he said, but added that he didn't think there was majority in Parliament for such an outcome. Hammond's comments could enrage anti-EU members of May's party, who -- along with the prime minister herself -- have argued against another vote. That split soon became apparent on Sunday when Brexit Secretary Steve Barclay told the BBC's "Andrew Marr Show" that that any majority in indicative votes planned in the coming week will not be binding. If Parliament voted for a softer Brexit, it would collide with the Conservative's 2017 manifesto and risk a general election, he said. The pressure on May is not over. In a front page editorial on Monday, the Sun newspaper called on May to resign to help seal her deal and deliver Brexit. Meanwhile, writing in the Telegraph, former foreign secretary Johnson said the government has "chickened out" on Brexit and implored the prime minister to abandon her deal and "come out of the EU now."